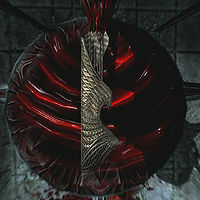 A Bloodcursed Elven Arrow is an elven arrow that has been tainted with the blood of a Daughter of Coldharbour, a female vampire created by Molag Bal himself. The arrows are visually similar to the elven arrows that are needed to create them, with a gray shaft instead of a golden one, with the fletchings being alternating shades of gray. The quiver is similar, being a more bleak color compared to the strong golden one of the normal arrows. When fired at the sun during the day with Auriel's Bow, it will block out its light for the rest of the day, negating the damage vampires suffer from it. It is the contemporary and counterpart of the Sunhallowed Elven Arrow.